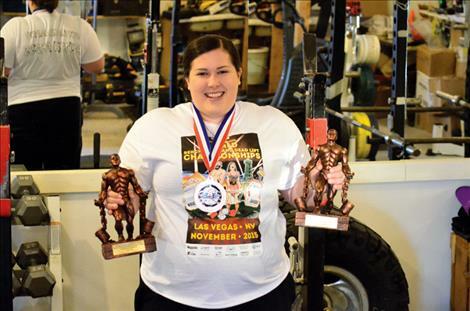 Rachelle Meidinger of Arlee holds a world record in weight lifting. 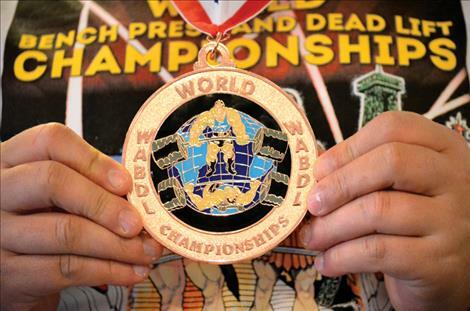 Rachelle Meidinger holds her competiton medal from the World Association of Benchers and Deadlifters. Rachelle Meidinger competes in Las Vegas for the world title with her trainer and the competition judge watching. 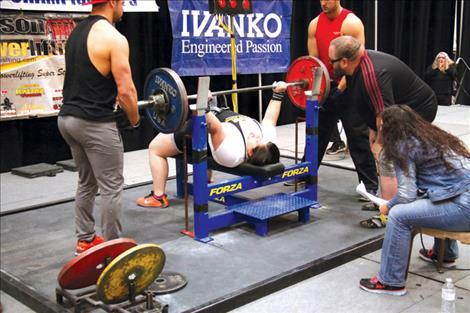 RONAN – Rachelle Meidinger, 21, broke her own world record by lifting 265 pounds during a bench press lift at the World Bench Press and Deadlifters Championship in Las Vegas on Nov. 22. “She already owned the world record, but she chipped it,” Meidinger’s trainer James Greene said explaining that she added another pound to her previous record. 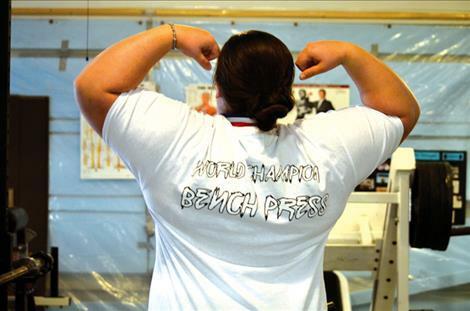 She also broke a world record in the push-pull competition that adds a person’s top bench press with their deadlift weight giving her a total of 618 pounds. She took second in the deadlift competition with a 365-pound lift. Meidinger competed with more than 500 lifters from all over the world. Each competitor was placed in a category for body weight, gender and age. Meidinger was placed in the women’s junior division for ages 20-25. At the competition, Greene was tasked with selecting the weight she would lift based on what she did during her training sessions. He put 236 pounds on the first lift, 248 pounds on the second lift and 253 pounds on the third lift. Because she was within a world record, she was given a fourth lift, and Greene put 265 pounds of weight on the metal bar. Meidinger made the mistake of looking at the numbers. Greene said lifting weights is about training hard and having the correct form, but the biggest thing he said is the mental activity. Meidinger was diagnosed as bipolar with other mental illnesses, so wrestling with her mind can be a challenge. She said the thought of not being able to accomplish a goal she wanted so badly was messing with her ability to lift the weight. “I didn’t think I was going to break my record,” she said, but she had to try. She positioned her back on the bench, put her hands in place, and took the weight off the rack. She brought it to her chest, and after receiving the press command, she lifted the weight up over her head. The judges watched closely and confirmed that she had broken her own world record. “I was glad I was able to do it,” she said adding that having her trainer’s voice in her head telling her not to give up helped push her to a new level. She started breaking records as a high school student in Arlee. She graduated in 2012. She was one of the first female athletes to lift 200 pounds at the school, and she’s been lifting even more weight ever since. She started training with Greene in his gym in Ronan earlier this year to help perfect her form and avoid injuries. She added 21 pounds to her original 244.3 bench lift record from earlier this year in Missoula. 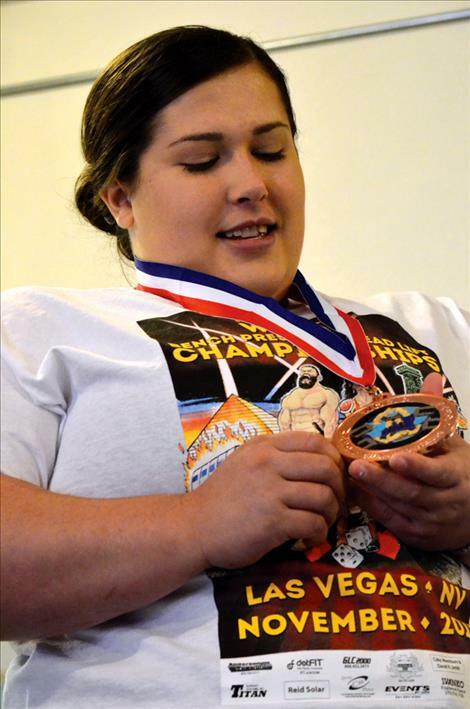 She took the record up to 264 in June at another competition in Utah, and now, her record sits at 265 pounds. She isn’t sure how high she can take the record, but she plans to keep training.